SIP is part of the digestive tract, located between the mouth and esophagus; SIP is also part of the respiratory tract, connecting the nasal cavity with larynx. 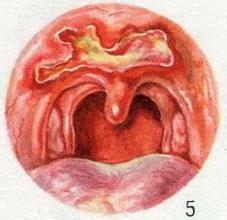 SIP consists of three departments: the nasopharynx (epipharynx), communicating through Hoan with the cavity of the nose; the oropharynx (Mezaparks), communicating through the throat with the oral cavity; laryngeal part of the pharynx, or hypopharynx (hypopharynx), tapering down in a funnel and communicating with the entrance into the esophagus and larynx. Under the mucous membrane of the pharynx are muscle (simatai pharynx), the reduction of which swallowing promote food lump in the esophagus. When getting irritating substances on mucous membrane of the mouth and throat, or by ingestion of foreign bodies muscles of the pharynx reflex decrease and delay their penetration into the esophagus and larynx. SIP is one of the voice of resonators. 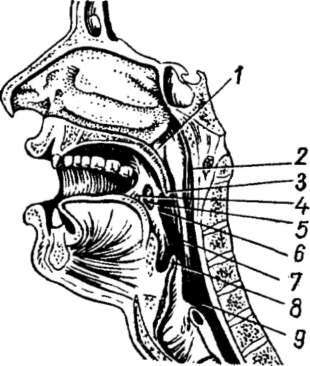 Dotted with taste nerve endings on the soft palate and the base of the tongue, throat performs a function of receptor taste of the analyzer. Damage of the throat can be isolated or combined with damage to other organs. In peacetime often observed burns mucous membrane of the pharynx, abrasion, puncture wounds sharp pieces of bone or foreign bodies entering with food (glass, the pieces of wood in the bread , and so on). Gunshot wounds of the throat are often combined. Treatment. With burns acids used diluted alkalis: lime water, mash of magnesium oxide, as well as the soapy water, milk, mucous broths, 1-2% solution of sodium bicarbonate. If a firearm or puncture wounds produce primary surgical treatment of wounds with subsequent layer suturing. Swelling of the entrance to the larynx, often coming after injuries of the lower part of the throat, can cause difficulty breathing, in which it is necessary to resort to a tracheotomy (see). Tuberculosis pharynx ( Fig. 3) there is relatively rare. The main subjective symptom is severe pain on swallowing, forcing patients to limit to a minimum the eating and drinking. Infiltration of the soft palate and the defects of the Palatine arches cause getting food into the nose, it can be unclear, nasal. Forecast isolated tuberculous lesions throat currently relatively favorable. Lupus throat rarely occurs in isolation, often combined with affected individuals. On the mucosa appears fine infiltration, which are formed superficial ulceration (Fig. 4). The condition of patients is almost not affected. The forecast is favorable. Treatment of tuberculosis of the pharynx (see Tuberculosis treatment. 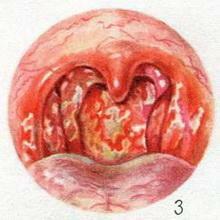 Syphilis throat occurs in all three periods of the disease. Primary ulcer may be localized on the amygdala, at least - on the back of the throat. 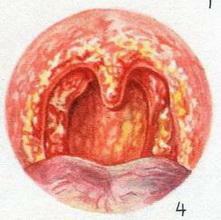 There are three kinds of primary sipila on the tonsils: erosive ulcerative and angelopoulou. Erosive form is characterized by the Presence of one of tonsil surface erosion. The amygdala is a slightly increased sharply expanded. The temperature of the reaction is usually not, during the subacute, the disease lasts several weeks or months. In ulcerative form on the amygdala is found ulcer dark red, irregular, with a value of up to 2 cm, with bottom, covered with grayish sebaceous bloom. 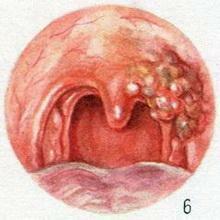 Seal tonsils and specific adenopathy nearby lymph nodes are the same as with erosive form. Angiopathia shape proceeds in the form of acute tonsillitis (amigdalidi) and looks like ordinary sore throat (see). The amygdala is increased, dense, rich red color. In the secondary period of syphilis on the mucous membrane of the pharynx and throat usually occurs simultaneously with the same skin manifestations (roseola and papule skin) or in the form of secondary sifiliguu on the mucous membrane of the pharynx and mouth - papules and wide condylomas. From the tertiary sifiliguu most frequent goomotrie lesions of the soft palate (Fig. 5), mainly in the form of diffuse infiltration or, more rarely, in the form of limited gommoni tumors. With the collapse gum are formed deep ulcers with sharply defined edges. Treatment of syphilis lesions of the pharynx (see Syphilis; local - rinse weak solutions of disinfectants (hydrogen peroxide, potassium permanganate , and others). Inflammation. The most common inflammatory diseases of the throat are acute and chronic inflammation of the mucous membrane (see Pharyngitis, Faringomikoz). Infection zagadochnyh lymph nodes can lead to the formation zagadochnogo abscess (see), and infection fiber side walls of the throat - okolorotova abscess (see). Tumors of the throat can be benign (fibroma, papilloma, angioma, lipoma, neuroma, retention cyst) and malignant (cancer and sarcoma). With nasopharyngeal tumors characterized by obstruction of nasal breathing, allocation from the nose cavity, lowering hearing; tumors of the oral and laryngeal parts of the pharynx (the sensation of foreign body, embarrassment, podergivani during the meal. Characteristic features of malignant tumors, bleeding from the nose or the mouth cavity, the defeat of the cranial nerves, increase (metastases) or cervical submandibular lymph nodes. The key to diagnosis is a biopsy. The prognosis depends on the stage of the disease. Treatment of benign tumors of the throat surgery. In malignant tumors of the nasopharynx and oropharynx is applied radiation therapy, but by tumors of the hypopharynx is combined method including radiation therapy and surgery.